We started teletherapy for my son Wallace (now 22 months old) in May, when he was just 18 months old. 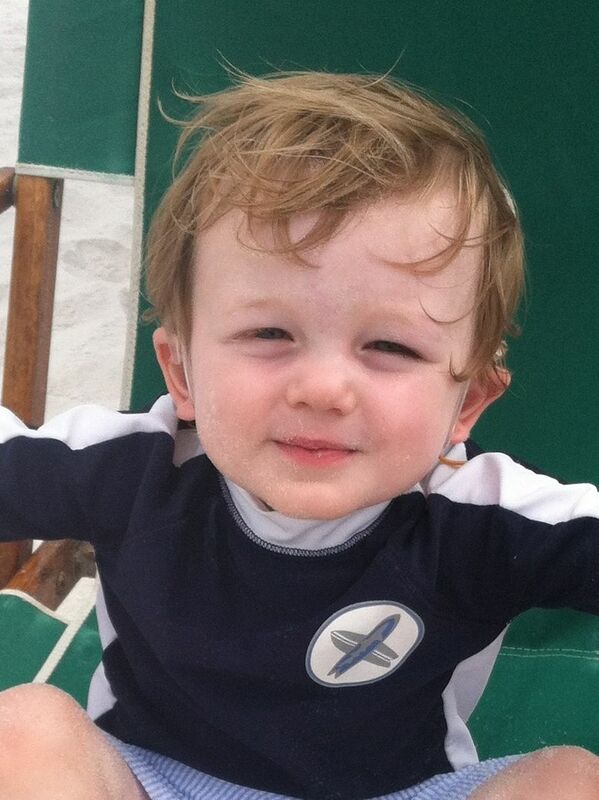 Wallace was born profoundly deaf, and received CIs in October of 2013, at 1 year old. Our main reason for going with teletherapy was so that we could continue speech therapy with Elizabeth. Having a speech therapist who is a certified AVT was incredibly important to us, and her approach and skill level had worked so well for us up to this point. Besides working with an incredible therapist, teletherapy had some other great aspects that appealed to us. We are able to stay at home for therapy sessions. This is so convenient for a few reasons. The first is that we are not rushing out of the house to make a drive to therapy, parking, etc, and generally wasting time each week. We have designated our living room to use for therapy time, and Wallace gets very excited when I tell him that it is time to call Miss Elizabeth on the computer. We are able to use our own toys, which means our at home routine each week is built into toys and books that we already have. With a second baby on the way, I love that I will not have to worry with childcare or taking her in the car to go to therapy. We get to do it all at home. One of my main concerns when we began was that Wallace would not be engaged with activities and with Elizabeth on the computer. He has never been one to love screens or TV. But he totally proved me wrong! Being able to interact with Elizabeth on the computer is so fun for him, but it also allows me to be in charge of our activities. Any parent of a child with hearing loss knows that you yourself must be well equipped to carry out all of your speech activities on your own. Doing teletherapy gives you amazing practice at this, because you are controlling the activities with Elizabeth’s guidance. He continues to be incredibly responsive to all of the work and play that we do at home that we have learned during teletherapy sessions. Lastly, our sessions are recorded. This means that my husband can watch our sessions and be just as involved in Wallace’s progress as I am. When we were driving to therapy, he was never able to attend because of work. But now, he can easily sit in on an early morning session before work. If we are traveling one week, all I need is my computer to be able to do therapy wherever we are. And if someone gets sick, rescheduling is never a problem. I know from experience that any type of change in your child’s therapy routine can seem daunting, but I encourage you to consider teletherapy. There are so many benefits of teletherapy and of working with a certified AVT. This entry was posted in Elizabeth Rosenzweig MS CCC-SLP LSLS Cert. AVT and tagged Auditory Verbal Therapy, Parents, Teletherapy, Testimonials, Toddlers. Bookmark the permalink.